This entry was posted in Uncategorized on August 21, 2014 by Nick. I tried to think of something even slightly profound in reaction to this ad, but I think these two words sum it up: sad and disgusting. Oh, and where’d they get that unbranded laptop!? It’s actually no big deal, since all of those trees are probably cell phone towers anyway. Just watch out for nano-ants in your pants trying to document what brand of underwear you’re wearing. 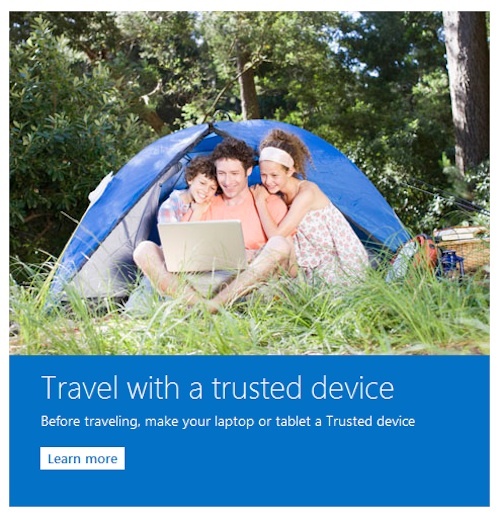 I’m pretty sure, by the way, that “Travel with a Trusted Device” was Smith & Wesson’s original slogan. One of the dictionary definitions of “camp”… “something so outrageously artificial, affected, inappropriate, or out-of-date as to be considered amusing.” Do these people know something we don’t? @ Seth I don’t think bringing the books along is as depressing as taking the laptop on a camping trip because I know from sad experience that the laptop on a vacation connects you to all the things you are trying to get away from. @Nick – I don’t see any reference to that slogan in a quick search. All I found was “Protected by Smith & Wesson”. But aren’t you making my point? Presumably the idea you’re conveying is gun = “scary/bad!” and thus laptop = “scary/bad!”. But I’d see that slogan for a gun as saying “This is a reliable tool, it won’t suddenly break just when you need it most” (something which would be of extreme concern when traveling in the old West – guns can jam up especially where there’s a lot of sand and dust in the air, and they were high-tech for the time). @Henry Beer – Again, why? @Laraine – OK, at least connection is an answer. But look at the visceral objections in this thread, it doesn’t seem to be about connection. And what’s wrong with delight in technology? I get the point about marketing an emotion, but that’s generic – ads tend to show people being happy using the product, for anything. Would you have the same “ugh” reaction to an ad showing delight in how well the tent worked to keep them dry in the rain? (which, note, is technology cutting us off from Nature). I was joking about Smith & Wesson, but you’re right about the sand and dust. As to your conflation of tent and laptop, I would gently challenge you there. Is a well-made tent really a tool that “cuts us off” from nature, or is it one that invites us into nature? It seems to me that you’re engaging in a reductio ad absurdum argument, which ends up being a way to avoid the hard work of evaluating the effects of individual tools. Yes, at some fundamental yet frivolous level, all tools are “unnatural.” But the real question, given humankind’s own tool-making and tool-using nature, is: how does a particular tool and its use affect our relation to and experience of the world, whether it’s the world of nature or of society or of culture or of something else? Nick, of course a tent cuts us off from nature – the whole point is to keep out wind, rain, insects, animals, etc. Because without employing tent technology and similar for protection against the elements, nature will tend to make you miserable, possibly sick, or even dead. I think the point you may be making is that this minimizing technology is typically used so that people can endure a higher level of nature overall, by being able to cut it off when it reaches too uncomfortable a level. But that’s like saying sunglasses and sunscreen don’t cut off the sun, but invite us into the sun (since they make being in the sun more tolerable). Note, that section was addressed to Laraine’s point about “delight”, and I’m claiming it’s fine to take delight when technology pleases you. When I first got a high-quality LED flashlight, I was delighted (pun unintended) by how well it worked compared to incandescent bulb or even low-quality LED versions. Regarding the “unnatural” argument, I’m pushing back on what I regard as very badly reasoned and seemingly fear-driven propositions. In fact, it’s exactly that “hard work of evaluating the effects of individual tools” which I’m asking people to do, and not seeing it (granted, it could be my intransigence, I’ll pre-emptively disclaim I’m aware of the possibility). It’s too easy to express “I didn’t grow up with this, and I’m anxious about it” as “Scary new tech which we must evaluate (meaning, come up with a story why the scary new tech is bad for us)”. If you have some rule like “If you go camping, don’t take X”, you have to explain with some *consistency* why X = “laptop”, but *not* X = “books”. Otherwise, it seems to reduce to “I grew up with books and like them so they’re OK, but a laptop is new and I don’t like it so it’s not OK”. What I believe I see is people trying to find some way of rationalizing that sensibility but not admitting it (parody: “Well, a laptop is cold iron, so will disrupt the magical energies needed by the elves and the fairies, but books are wood-based and so not polluting to the ecology of spirit folk”). Seth: When I see an add for a tent made with the newest technologies that will keep the weather out even better than the last generation of tents, a whole world of possibilities opens up for me. This is technology that will allow me to travel places that seemed out of reach before and it will allow me to make longer journeys, further from everyday existence than ever before. Now please tell me what you see when you look at the Microsoft ad. Which possibilities open up for you? Hmm. The laptop seems to me to be undeniably the more powerful siren, though being engaged by a very good book could also incline one to stay in the tent all day. Even so, isn’t it obvious that the non-human built world coexists better with a mono-medium than a multimedia technology, since its own sounds, lighting and other sensual offerings might either interrupt or even improve the experience of reading a book? Either is a possibility, since one stays much more aware of one’s surroundings. The laptop is a more enclosed environment, and tends to repel the outside world. What I’m wondering is how “nature” competes with its own idyllic images, especially when they are combined with fancy products? It’s the question of opting out again. Those of us who desire the occasional autonomous, off the grid experience, or simply a public space in which no development or “improvement” is taking place seem to be having to explain and justify ourselves more and more often. @ Seth I don’t see anything on the post where Nicholas Car says it’s scary. Where do you get that? @VanStranden – While I don’t want to give you a hard time, do you really think there are no, zero, none, nil possibilities opened up by a laptop when camping? Just off the top of my head: Detailed terrain visualization. Real-time weather information and forecasts. Extensive plant and wildlife documentation. Yes, some of this could be duplicated with the appropriate books, but it’d be a pretty big and heavy stack to haul around. Again, not to pick on you, but such views are why I think what’s going on typically is that people have a scary-bad-tech emotional reaction, and then try to justify it intellectually. @Cindy Wolff – it’s referencing a longstanding difference of views regarding the relationship between humanity and technology. I’ve been reading Nick’s blog for many years, so it’s part of an overall context. People generally side with what personally suits them. My family and I are distracted when we have ready access to a computer, TV, smartphone, the Internet, etc. There is something intangible that nature gives us that I can only get if I “let go of,” or move farther from, distracting technology for a time (be it 15 minutes or a few days). This is the root of my respulsion about the image that Nick has displayed. @Seth – The social construction and sacralization of nature is important to explore, but its also important to keep in mind that, though we may become relativists in our values, we can’t become so in our bodies (not for lack of trying), which have evolved to subsist safely within certain environments. Much like free market ideology, the hubris of technological solutionism is in the continual parlaying of apparent gains in the face of sneaky, hard problems showing up over the long term that can’t be engineered away, at least not in time. Every time the bottom that falls out on utopia, we agree that we weren’t quite capitalist enough, weren’t quite technological enough. The problem isn’t always the tech per se, it’s the outlook that demands breakneck development leaving no time for things to be explored before they are allowed to become ubiquitous. It probably can’t be regulated anyway, so I don’t really know what we’d do about it, but there it is. Good examples of the body’s connection to the natural world around 30 min. in. Where do you read in my comment that I think there is no use for a laptop while camping? I told you what an ad for new tent technology would mean to me and asked what the Microsoft ad could mean to you. Because I’m genuinely curious about where you stand. What I get is a seemingly knee-jerk reply that makes completely wrong assumptions about where I stand. It is revealing though. It shows how crude your understanding is of the arguments of people who criticize technology. So since you didn’t ask, allow me to tell you where I stand on the Microsoft ad. Assuming the examples you gave serve to illustrate your position, I think you should think a bit harder about technology. “Detailed terrain visualization. Real-time weather information and forecasts. Extensive plant and wildlife documentation.” I can think of those, and of dozens more. But the people in the ad are not taking a terrain visualizer with them, or a weather forecaster or flora & fauna documentation, they are taking a laptop with them. And that makes all the difference. Because with it, they also take Excel, unfinished work, games, Facebook, Twitter, Mail, news and YouTube with them. To name a few. (Please note that in your examples you already assumed they had an internet connection). A laptop is by design a general purpose machine. And using a general purpose machine as a single purpose machine means saying ‘no’ a great deal of the time. I believe that “If you can check your mail, you will check our mail” and that when using a laptop for, say, real-time weather information, it takes a really strong mind to not end up on the Wikipedia entry for 13th century Mongolian pottery five minutes later. So I don’t think the problem is that the laptop cuts you off from nature. I think nature is completely irrelevant to this discussion. The real problem is that the laptop is intrusive technology, constantly forcing you to make decisions about what part of it to use and what not. Of course there are useful things you can do with a laptop while camping. But that’s only part of the story. Now compare that with the new tent technology. Transparent, non-intrusive and empowering technology. To take another real-life example: When I go hiking, I want detailed terrain visualization. So I take maps (they won’t run out of batteries, and develop my sense of orientation). And I want real-time positioning. But I would never take a general purpose laptop or smartphone for that. I take my single purpose GPS, which I have learned to use like a tool over the course of a few years. I have loved GPS technology since it became available, even though I didn’t grow up with it. It’s just wonderful how this technology has brought me closer to nature! VanStranden – I apologize if I read you unduly uncharitably. It seems to me you were *implicitly* asserting that were no possibilities opened up by a laptop, just in the form of a question. Let me elaborate on where I stand: While I wouldn’t put it as “crude”, I’m upfront in that I’m extremely skeptical that there is not much except reactionaryism behind *many* (not all, not every, not without any exception whatsoever in the known universe, but *many*) “of the arguments of people who criticize technology.”. As I put it to you in a previous thread: But I think I’ve been consistent all along that the problem is evidence it’s not all just get-off-my-lawn in flowery language. Look at it this way, since we’re discussing machines, consider a sort of Turing Test. On one side is a great literary-type philosopher of society and technology. On the other side is an erudite writer, but who is a calculated panderer to fogey-fear, and will cynically flog the themes that anything geezers grump about is harming your brains (especially for kids) and represents a new low point in anti-humanism. Can one tell the difference? How? Part of the basis of my belief that it’s commonly a game of how the new stuff is scary-bad, is the way the stories tend to stop at what the writer’s generation grew up with (note, in comparison, the Amish *don’t* do this – they worry about e.g. *electricity*, and I respect that for philosophical consistency at least). So, when you say “the laptop is intrusive technology” – OK, there’s an argument. But would you agree “the radio is intrusive technology constantly forcing you to make decisions about what to listen to and what not – it might be acceptable to take one for weather information, but it takes a really strong mind to not end up listening to the latest hit song five minutes later.”? Pre-emptively, you might reply, but the laptop is dramatically more dangerous that way than the radio. And my rebuttal is that even if so, it still seems an absolute amount so that your “intrusive technology” designation must dictate that people should only take weather-channel radios, and general radios are tools of temptation. The “unnatural”/live-in-caves argument is a kind of zero-level, simplistic, version. But I’m not impressed by criticism of technology which seems to me to say “Don’t think it’s about the crude, trivial, case about living in caves. It’s much more sophisticated than that. We don’t reject all technology – only the technology developed which we didn’t grow up with!” (and, sigh, which is visible in an anxiety-producing manner, to exclude items such as solar-power, wastewater treatment, construction technology, which would fit the literal words there, but clearly not what I mean in context). The sophistication being in creating those arguments, as to why what-I-grew-up-with is OK, but the new stuff is the devil’s work. Good to see you’re fine with GPS. There have been quite a few posts here critical of it (“We talked, in particular, about how the reliance on GPS systems may weaken our ability to build mental maps of space …”). This may blow your mind, Seth, but it’s actually possible to be critical of a general, unthinking reliance on GPS systems while also praising particular, thoughtful uses of the same technology. Your unwillingness to allow for subtlety in responses to tools and their uses, and your attendant need to mindlessly slot other people into reductive “fine with it” and “against it” camps, is something you may want to subject to questioning — preferably before you post your next comment. But both 1 and 2 lead to the same result, so continuing to comment is objectively inadvisable no matter which one (or both) is the case. I fully admit I tend to get-into-it and it’s a bad habit. By now, I should know no good comes from it. I’ll take this thread as another lesson :-(. I’m not fine with my GPS. At least not with how the unit came out of the box. I wrote: “I take my single purpose GPS, *which I have learned to use like a tool over the course of a few years*.” What do you think that last part of the sentence means? It means I’ve mastered all the relevant functions. It means I’ve configured it in such a way that it fits my use. But far more importantly: I’ve learned when to use it and when not to use it. I’ve learned when it helps me reach my goal and when it prevents me from doing that. When to rely on it and when to use my other navigation tools. And it has helped me realize that in the end it only serves to support and develop the real tool: My sense of terrain and orientation. “Learning to use it like a tool” means for me building a clear relationship with it, so that I almost forget I’m using technology, that it becomes an extension of myself. And I think that’s mainly possible because it’s a single purpose device. And that’s why I would never take a (general purpose) smartphone with me for GPS duties, even though it’s able to do a far fancier job. Both technologies I didn’t grow up with, but one I embrace and the other not. Errrr, no. And to be honest, your reasoning baffles me, thinking you have no clue what I mean with ‘intrusive’ and ‘general/single purpose’. You really seem to think that a single purpose radio would, say, only broadcast weather information… Like I said before: You should think harder about technology. A radio is broadcast only and stations flow from one program to the other. Everything has been allocated into time slots over which you have no control. So if you don’t tune into a program on time, you’ve missed it. A radio doesn’t force you “to make decisions about what to listen to and what not”. The only decisions you can make is to change the station or turn it off. In practice, people will look for a station they like and leave it at that. But opening a laptop means opening all the machines it can be. A radio, a television, a game console, a library, a movie editor, a news channel, a typewriter, a chat machine, a photobook, a music collection, etc. That’s what I mean with general purpose. With internet attached there is a constant on-demand stream of novelty that you can actively manipulate. And somehow can hardly resist to manipulate, unless you make a conscious effort. That’s what I mean with intrusive. There’s no way to build a relationship with a laptop as a tool because it is many tools. And it will even be more tools as new programs and apps come along. You say you felt the need to comment: “… since the post bothered me in that it seemed to be saying “Look, here’s tech (that I didn’t grow up with) in a nature setting – how horrible, aren’t you repulsed?”” If the post would be saying that, I wouldn’t read this blog. It would be too simplistic, too emotional, too superficial. Nature has nothing to do with it, although it’s an understandable first reaction. Commenter Daniel C. has repeatedly tried to drag the discussion into that territory, but I think he is directing canine utterances up the erroneous perennial woody plant – albeit eloquently. Your pet theory simply doesn’t hold. Not because you’ve been presented with many counterexamples, but because it only allows for only one criterion to accept or reject a technology: Whether you’ve grown up with it. That is far to simplistic to be taken seriously. It doesn’t accommodate all the subtle ways in which people develop a relation with technology: Using it, rejecting it, using parts of it, configuring it to meet their specific needs, etc. Nick’s reading of your shorthand phrasing is not uncharitable. They perfectly illustrate the stubborn (not intransigent) binary nature of your argument, even though it should be clear by now this is too reductive.